WoP is the domain of ENTE’s comic strip super-hero Padman and his motley crew. It’s their mission to make your game with some seriously addictive fun, whatever your skill level and whatever character role you jump into. Over the years maps have been revamped, bots improved, killerducks kept hungry, weapons re-polished and much more, such as new sounds, skins, secrets, effects, and powerups! In all, there are 24 maps. Each supports up to 7 game modes, comprising WoP’s unique Spray Your Color (Team), Last Pad Standing, Big Balloon and of course Capture The Lolly, as well as those old favourite Free For All (Team). Meet scaled-up and richly detailed maps of everyday places where imaginative characters go berserk with an array of colourful plastic weaponry and power-ups. Start rockin’ to the soundtrack of Dieselkopf and Neurological soundtrack and the Pad-Anthem, performed by Green Sun. So grab your earphones. Join our [PAD]Community, use the forum, add articles, media and downloads to the groups profile. Today, the WoP standalone is 12 years old! Happy Birthday! World of Padman was originally released on June 18th, 2004 in version 1.0 as a modification for Quake 3 Arena. 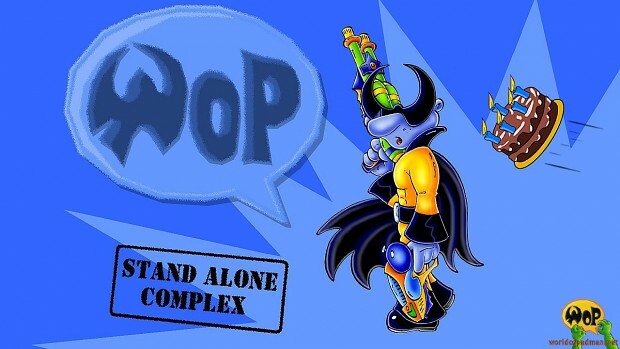 Just three years later, on April 1st, 2007, however, a stand-alone version with WoP 1.1 – Stand Alone Complex was released. World of Padman appeared for the first time as an independent game and the in Germany indexed Quake 3 Arena was no longer needed to play. For the WoP team, this date is therefore a very important milestone in the development of the game. World of Padman got a lot of attention in the media right at that time, as can be seen on our media coverage page. We took the trouble to compile an overview of the known and essential articles, reports and mentions in chronological descending order. Of course, this list will not be complete, so we look forward to being alerted to missing posts. Also, for copyright reasons, we can not put all posts there online for viewing as we explicitly require the permission of the copyright holders. But we have already contacted many publishers and editors and ask you for a little patience. We will update the list constantly and in the meantime we hope you enjoy browsing and discovering! The following is the publication data of the main WoP versions listed. The last version can be found on our website under Download. World of Padman 1.5 full installer for Windows. Fight your way through unique game modes with funny weapons and powerups as a cartoonish Pad character. This is a 7z-archive containing the NetRadiant 1.5 level editor from 21st June, 2015 for Windows (32bit) created by Ingar. The complete World of Padman v1.6 GPL source code. World of Padman is active again!? say what? I've been playing the game since September 2007 and I've collected a ton of content generated for it (including nearly-lost-forever addons). I've got my interest back after a while and been updating my unreleased maps, competitve gamemode and a bunch of other stuff. Hopefully (when released) will inject some new life to it. Anyway, I'm thinking whether I should upload some of the lost content here (and give proper credits) or not. Any intrested? That is probably content before WoP was a stand alone game. You can find some of it as addons for Quake 3 Arena via ModDB. Yes please upload the lost content! I'd love to test these maps and addons with my friends. WOP is the game we play the most on LAN! Absolutely would be super interested! I have a group of people I still LAN this with almost weekly. Great game, shame not many people don't know more about it. If only it was that easy. We've discussed that internally years ago but there were a couple reasons against it. Sorry. One of the most polished indie games around with insane maps, innovative gameplay and a unique art style that pushes the ioQuake3 engine to its limits. Great fun and the attention to detail alone makes this game worthy of your time. Nov 10 2007 by INtense!